Following yesterday first failed breakout attempt above the bullish falling wedge that was highlighted on QQQ earlier in the week, the Q’s regrouped & went on to make a non-impulsive breakout & backtest of the wedge later in the day followed by a gap up today. That gap & the brief pop following the open to the Q’s up to kiss the dual resistance levels of the 50% Fibonacci retracement level (of the move off the March 21st high down to the recent lows) and the 179.72 price & gap resistance level. My preferred scenario has that being the end of the run for QQQ and failing well shy of the measured price target of the pattern, which would come in right around that previous March 21st FOMC-induced high of 182.83. 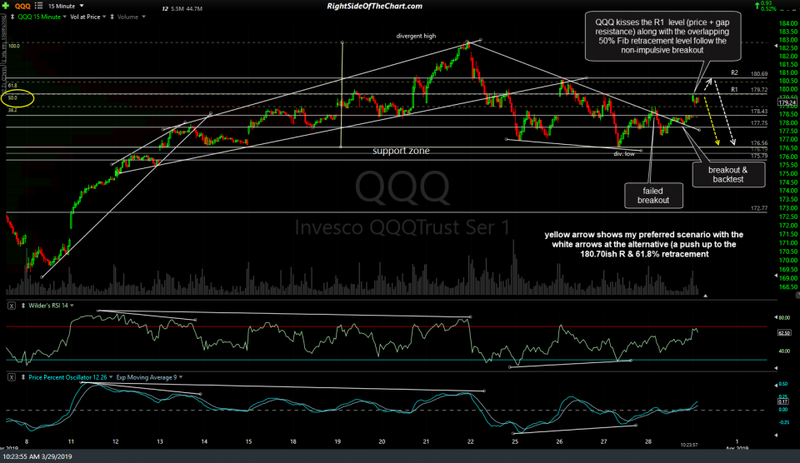 Should QQQ manage to take out 179.72 with conviction, the next resistance & likely target comes in around 180.70 (price resistance & just above the 61.8% Fibonacci retracement level. 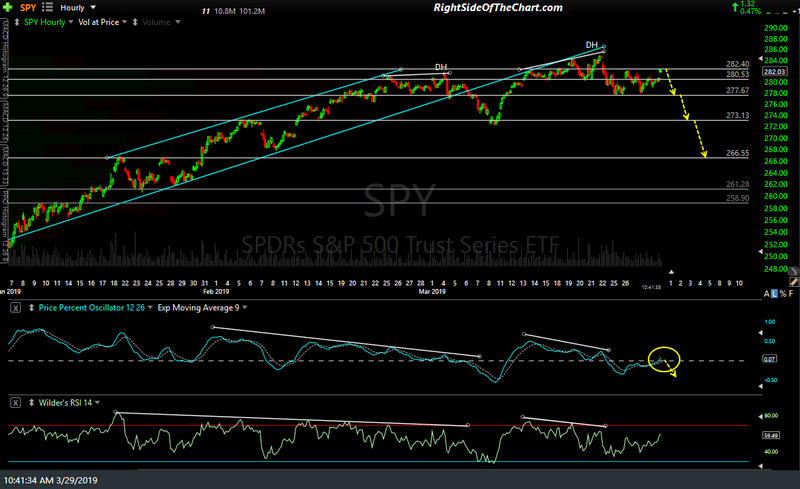 Meanwhile, SPY is currently testing the 282.40 minor resistance level on the 60-minute chart & remains comfortably below last Thursday’s high at this time with the PPO signal line (9-ema) currently backtesting the zero line from below.